Location is a key consideration; as a general rule anything under a one-hour drive is best… you don’t want a super long commute sending your nerves through the roof. Think about the entry fees and how many comps you plan on entering. Your decisions will also come down to what genres are offered at what comps, but most sizable competitions offer a wide range of age sections and genres. Doing too many competitions throughout the year can put strain on a dancer. Things to consider when deciding how many comps to enter are: time management because every family has several commitments, and planning as there may be some comps that lap over each other time-wise. If you are interested in doing a solo it is best to start off with one and in your strongest genre (which is hopefully your fave too). To prepare a solo you will need to be totally committed and practice what you learn after each private lesson. Remember, it is just you up there so your time practicing in the lead-up will make all the difference in those nervous moments before you run out on stage. Most solos are limited to either 2:30min or 3min and to master the choreography for a solo to this timeframe may take approximately 8 -10 one-hour private lessons depending on your learning speed. Groups or Troupes are an exciting aspect to competitions. It is important to be aware that you are part of a team and if you join at the start of the year the implication is that you will attend all the competitions for that year. Some schools have competition agreements so that dancers and parents are fully aware of the commitment involved. It is never fair on the group members or your teacher if you suddenly leave the group just before a comp weekend. Injury, illness and family matters are of course excusable, but a general rule is to treat your dance group like a sport team in which your position is crucial (e.g. how would you play Softball without a pitcher or Netball without goal shooter?). Whether it is your solo, duo or a group of 30 dancers, the advice you are given from your adjudicators should be treated as gold because it comes from fresh eyes, from someone who knows the dance world and wants you to be the best dancer you can be. Read more valuable tips from Rach about comps in our latest issue on sale now! NSW, Vic, Qld, ACT, SA, WA, Tas. Styles: Jazz, Hip Hop, Pom, Lyrical/Contemporary, and All Star Cheerleading which encompasses stunting, pyramids, tumbling, tosses and dance. 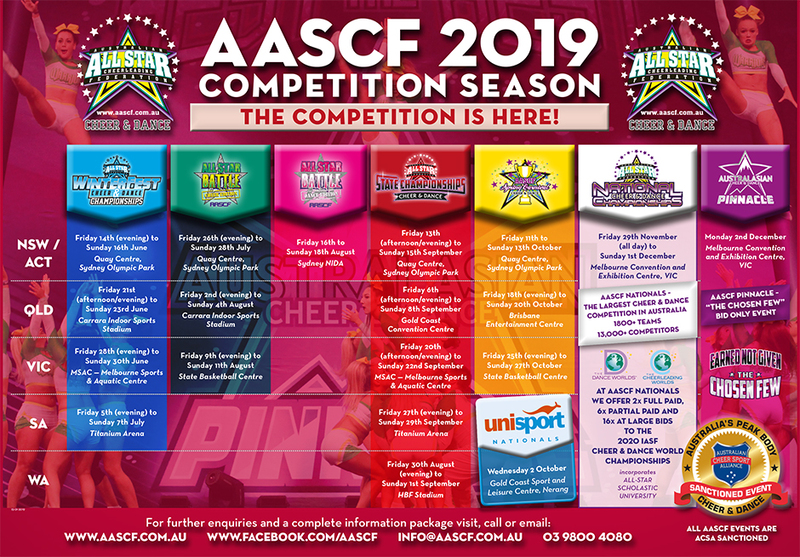 AASCF is Australia’s largest and most prestigious Cheer & Dance event company with over 52,000 athletes participating in 20 Championships across Australia from June to November. The grand finale is AASCF Nationals, in last week of November, where over 1400 teams from across the country compete for the coveted National Champion title. All-Star, competitive Cheer and Dance is a fast paced, dynamic sport that encompasses dedication and a strong work ethic from the male and female athletes that participate. It is as physically demanding as any other mainstream sport and is one of the fastest growing team based athletic sports in the World. All Star Cheer and Dance competitions are the focus of the athlete’s training where they test their hard work and skills against teams of similar level and age. All Star competitions are an incredibly exciting and social event where sports combine with theatre, judged not solely on the sum of its parts, but on the overall entertainment value of superior technical athleticism combined with creative presentations. Hundreds of thousands of dancers have been through the CSTD exams and competitions. What most don’t know is that officially we have been registered as COMDANCE since 1992. From this year we will also be publicly known as COMDANCE. It’s a new era. COMDANCE continues to offer inspiring, creative and engaging syllabi that is synonymous with the CSTD name. After 85 years of unparalleled dance training we not only offer contemporary and challenging work but also allow for teachers and students to work in a creative environment. 37 regionals around Australia, New Zealand and the UK . Established 24yrs. Australia Biggest National Dance competition. Styles: Jazz, Broadway jazz, Jazz No Tricks, Tap, Slow Tap, Speed Tap, Contemporary, Lyrical, Lyrical No tricks, Classical Ballet, Song and Dance, Song and Tap, Hip Hop, Acro, Own Choreography, Neo, Vocal and Open. Sections: Solo, Duo, Trio, Quad and Troupes. Troupes average age. Created By Kylie Drew this year we are celebrating 24yrs of FYD competitions in Australia. We have proudly been offering a positive and fun place for dancers of all abilities to dance for all those years. With 37 regionals we are now officially Australia Biggest national Dance competition. 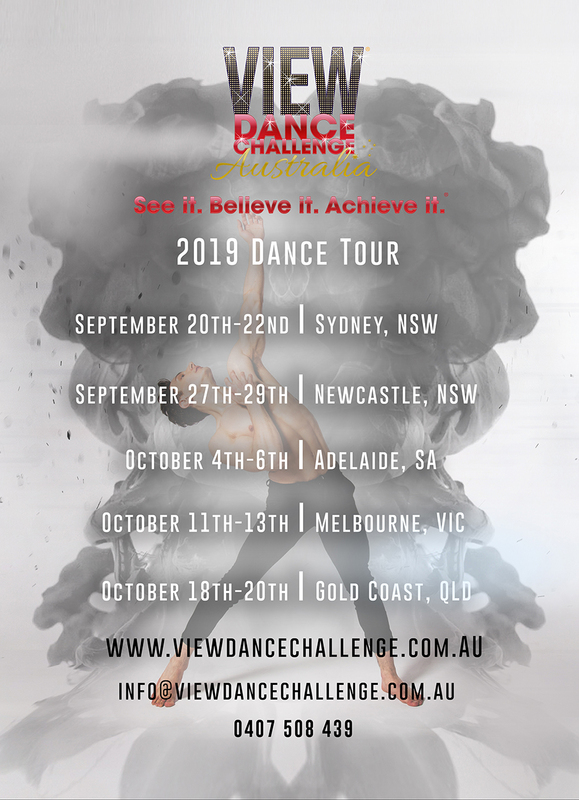 Over the years we have expanded into one of Victoria’s largest and most popular dance competitions and this year as well as travelling to all states in Australia and New Zealand we will be expanding our competitions to international competitors and travelling across the UK. Our National Finals are deemed the “Super bowl of Nationals” with top dancers from all across Australia and NZ flying to win amazing prizes and cash. totalling well over $50,000 just a Nationals alone. Champion troupe Junior and Senior Winning $1000 cash and Champ Dancers winning cash prizes, trips to Melbourne, Free entries to UK and USA competitions and more. We have a reputation for being professional on time, family friendly and inclusive of dancers of all abilities. We have Masters and Adult sections and Additional needs sections so everyone can Follow Your Dreams at our competitions. Follow Your Dreams is to provide young children\teens and young adults and Adults everywhere with the opportunity for personal growth, increased self esteem and character building, through a world class, professional dance competition experience. Come along and join in the fun. A family run company where our motto is “Run by my family, perfect for your family” Many regionals have sold out already this season, don’t miss out enter today. Remember dreams can come true at Follow Your Dreams National Dance competition. Styles: Jazz, Tap, Ballet, Hip Hop, Lyrical, Acrobatics, Broadway Jazz, Contemporary, Vocal, Production. Hollywood Bound has now become Australia’s most popular new competition, with $85,000 cash and prizes to win; it could be your dream that comes true. Anyone can be a Hollywood Star. Hollywood Bound has had another successful 3rd year. Our glitzy and very classy National finals are a testament of what the Hollywood Bound producers can create that has so many talented dancers coming back for more. With the success of our 1st ever Dance Cruise competition at sea, a first for Australia has given another outlet for Dancers. Take part in the prestigious Dancer of the Year pageant, created by Peter Oxford that has launched so many dance careers. When you are part of Hollywood Bound you are supporting 100% Aussie owned and operated dance competition providing Jobs locally. Jump Dance Challenge is so much more than just a competition! Our fun and friendly events provide an encouraging platform for all ability and ages to come together and dance. It is an opportunity to showcase all your hard work and talent while reaching personal goals. Our industry professional judges are there to give feedback which is encouraging, inspiring and builds confidence in each and every single person who steps on our stage. We believe in you and you should too! Amazing prizes, amazing trophies, amazing awards, amazing workshops! Come Jump with us and we promise you will not only grow as a dancer but you will make the best memories with new and old friends! Styles: Ballet, Pointe, Jazz, Tap, Lyrical, Modern, Ethnic/Indigenous, Acro/Gymnastics, Song & Dance, Musical Theatre, Hip Hop/Funk, Open, Contemporary, Student Choreography, Super Line, Production. KAR is dedicated to recognising and encouraging dancers across the world. Our stages will be shared by thousands of dancers with a variety of ages, talents and abilities. 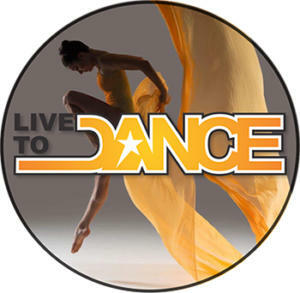 Two levels of competition give all dancers their moment to shine in a positive, rewarding, and exhilarating environment. We also acknowledge the achievements of teachers, choreographers and parents for their hard work and commitment. KAR has provided Australian dancers with many opportunities in the last four seasons: trips to Hollywood, CA – New York City, dancetrain cover shoots, KAR National Finals in the US and official nominations to the Industry Dance Awards. Our online registration process gives parents and studio directors full control over registrations, digital music uploading (eliminating CD’s), audio commentary, score sheets and all digital media. All of our competitions have a panel of three leading industry professionals; 1 Australian and 2 American, providing valuable feedback. We are honoured to be a part of the Australian Dance Community and look forward to an exciting season 5! Genres: Ballet, Pointe, Jazz, Tap, Lyrical, Modern, Ethnic/Indigenous, Acro/Gymnastics, Song & Dance, Musical Theatre, Hip Hop/Funk, Open, Contemporary, Student Choreography, Super Line, Production. Rainbow in the USA has been called “the competition with heart” for a good reason. Rainbow has never lost sight of the fact that its success is owed to the hardworking teachers and studio owners that appreciate a fair, fun, organized, and on-time competition. From its low-stress environment, unique awards, online registration, and state of the art judging and scoring, we strive to achieve the same recognition within Australia by providing teachers and dancers across the country with this same quality. All of our Australian Competition cities will have 2 American International Judges and 1 Australian Judge! What this means, every competition performance will receive 3 audio/video critiques for their performance…. That’s just like having 3 private lessons from 3 different Industry Professionals! We would like to thank everyone in the Australian Dance Community for helping make Rainbow Season 2 a huge success in Australia! We are forever grateful. Come join us for season 3! Royal Academy of Dance Awards and competitions – an annual programme of state based Awards recognising excellence and achievement. With the oldest of these awards being established 44 years ago, the RAD has a long history of recognising excellence in its students. Students participate in open class as well as learn and perform set choreography and have the chance to display the dancers’ own choreographic skill. The awards allow students to showcase their technique, performance and artistry skills in professional theatre settings. With cash and prizes to be won and high profile adjudicators to impress, the RAD awards programmes are a true marker of achievement and a window of opportunity for the talented. 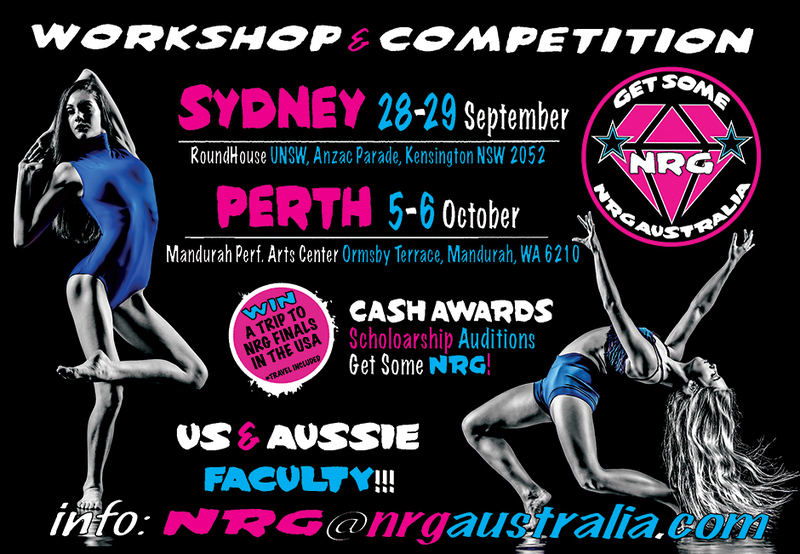 NRGaustralia is an integration of Knowledge, Talent & Style that takes dance workshops & competitions to a new level. Merging the best instructors from the US and Australia we change the game! What sets us a part is the FUN factor, work with the best in the world & have a great time doing it. Inspiring and entertaining classes with scholarships to Au events & our US finals as well as Video Critiques from our judges & FREE Pictures and Videos along with CASH awards for our competition and NRG OnSet, our one of a kind Dance Video shoot! 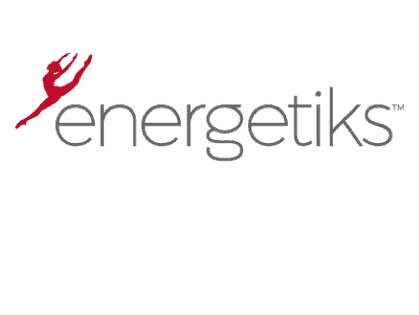 NRG is an event with the focus on YOU! Produced & Created by Australia’s own Peter Oxford, hailed as the most successful National Dance competition ever created in Australian history. Showcase & Hollywood Bound have dominated the Australian Dance competition industry since the mid 1990s. Now celebrating our 25th anniversary January 2019 with a huge Australian Dance Championships event on the Gold Coast, which will be not only exciting but huge. Now having awarded over $2 million in cash and prizes over the last 24 years many dance studios can see why its the most innovative, progressive and popular dance competition operating in Australia. Join our amazing team of staff & judges for our 2018 season where we will award over $200,000 in cash and prizes. 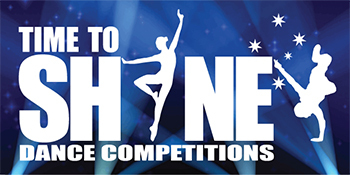 You are part of Australia’s most elite Dance Championships where “Everyone’s a STAR at Showcase!” Remember to support Australian owned and operated dance comps, this means you keep the jobs and opportunities here locally while giving future generations a safe and fun environment to perform at. 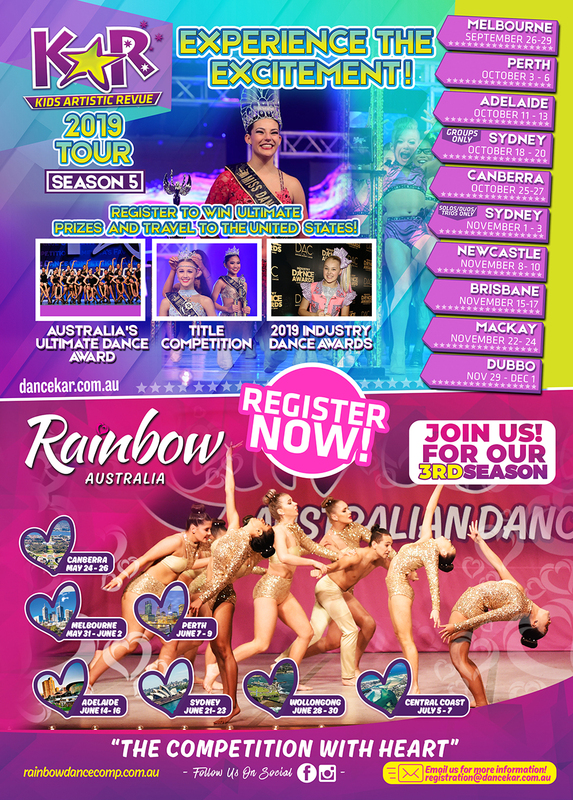 Time To Shine Dance Competitions is fast becoming one of Australia’s Largest & most friendly Dance Competitions, and we are coming to a location near you! Amazing and encouraging adjudicators lined up for every regional! Special Awards: Most Promising, Most Versatile, High Score & Judges Choice in both Junior & Senior sections. At each Regional one scholarship dancer will be awarded scholarship to the Australiasian Ballet Challenge. Always friendly and fun with a zero tolerance towards bullying or harassment! FREE programs and FREE entry into the audience for all your family and friends! 2019 Season promises to be the BEST Yet! 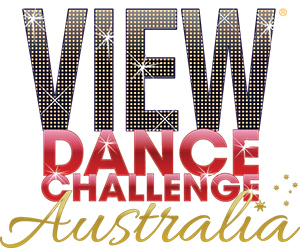 VIEW Dance Challenge is Australia’s Newest Dance Competition! From our amazing awards, to our incredible staff and our 3 distinguished adjudicators at every event, we are confident that you’ll have a refreshing competition experience. We are proud to offer amazing awards which includes an all inclusive Trip for 2 To Fiji to the Top Studio, $1000.00 to the winner of the FINAL Hour Showdown, invitations to our Greece Intensive and $10,000.00 in awards and cash prizes at every event. Our event is ALWAYS on time and our final schedule is guaranteed to be released 30+ days prior to the event. Register now for an event that is like no other. Join the VIEW experience and remember, if you can See it and Believe it, you can Achieve it! Entry Earlybird Deadline: 4 May, Deadline: 13 July. Styles: All styles of Dance, Vocal, Instrumental, Speech & Drama. 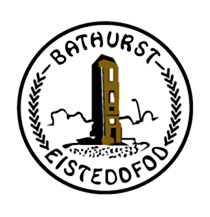 Now in its 74th year, the Bathurst Eisteddfod is the oldest Eisteddfod west of the Blue Mountains. Bathurst is a comfortable 2½hrs drive west of Sydney. With over 180 sections offered for Dance there is something for everyone! We have Junior, Intermediate and Senior Championships in Ballet, Jazz, Tap, Contemporary, Modern/Lyrical and National Character as well as Junior ($300) and Senior Scholarships ($700). 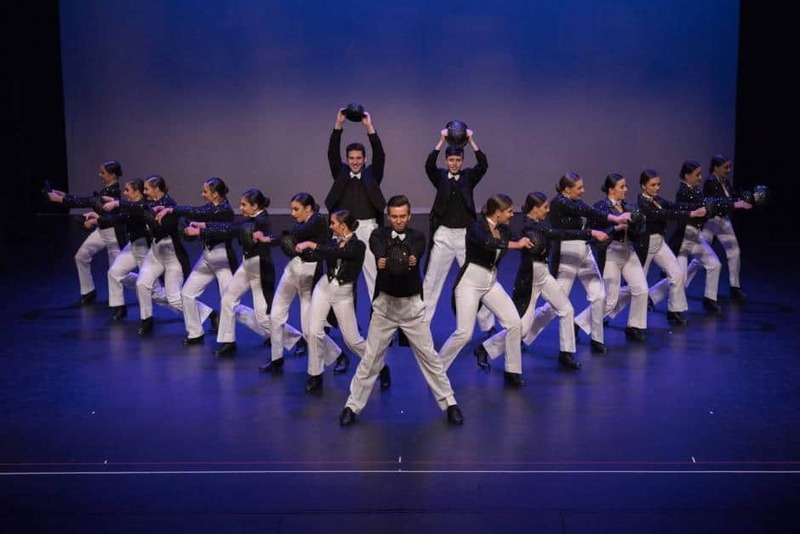 Our Groups weekend is always very popular with NSW and ACT dance schools. The Bathurst Eisteddfod prides itself on fostering a friendly and welcoming eisteddfod. We also have sections for Public/Private Schools to enter with 4 categories – Stage 1 Dance, Stage 2 Dance, Stage 3 Dance & Secondary Years 7-12. Solos: Tap, Jazz, Classical, Lyrical, Contemporary, Song and Dance. 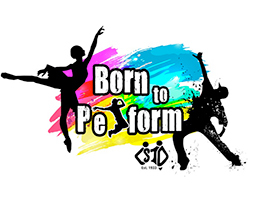 Groups: Song and Dance, Classical Ballet, National or Demi Character, Jazz, Lyrical, Contemporary, Tap, Musical Theatre, Hip Hop and Broadway Jazz. The B.D.A Shire Festival of Dance is a Not for Profit run competition. We promote and foster the enjoyment of dance in a fun and friendly atmosphere. Great prizes including Cash for open senior age solos and large group sections. We have something for everyone as well as Showcase which includes free entry for any competitor who places 1st in any Open Section. Entries Close 7 May 2018. Syllabi, including entry forms, are available to download. For further information please visit our website. Styles: Dance, Vocal, Instrumental, Speech & Drama. Sections: Sections for all ages, children & adults. Scholarships are available in all disciplines including $2000 Ballet Scholarship and $2000 Dance Scholarship both of which will be held on Sunday 2nd June. 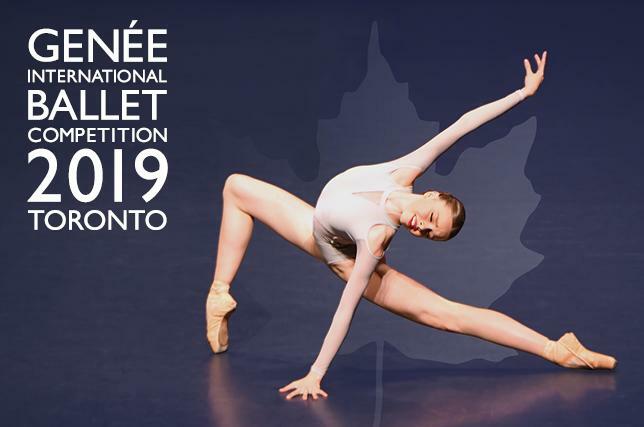 Senior Championship for $300 are also available for Tap, Jazz/Contemporary, Ballet and National Character, as well as Junior & Intermediate Championships in all styles. Solo, Duo/Trio sections for dancers from 5 years to adults are also offered in all styles. Senior sections are mainly over the weekend of 31 May -2 June, with younger age groups held earlier in the week. All other performing art styles are catered for with numerous sections for all ages and abilities. $2000 Scholarships for each Instrumental and Speech & Drama. $4000 Snr. Vocal Scholarship and $750 Jnr. Vocal. The hotly contested Vocal Aria Championship carries prize money of $15,000. All sections are held in the Cowra Civic Centre, which has first class facilities available for the performer. Syllabus and entries now available at stardom.com.au . LTDUC is a friendly, fun, unique competition offering sections to suit first time performers in a nurturing environment, or competitive sections for seasoned performers with industry recognised judges. We provide a range of sections with individual age groups as well as major cash awards for troupes and soloists. Our Open 14+ competitors and all championship winners receive Cash awards. We provide many scholarship and workshop opportunities for our dancers to further their dance education and experiences. NEW: “Senior Solo Challenge”. Moondance offers competitors over $1000 cash! Looking for a different style of competition for your students? 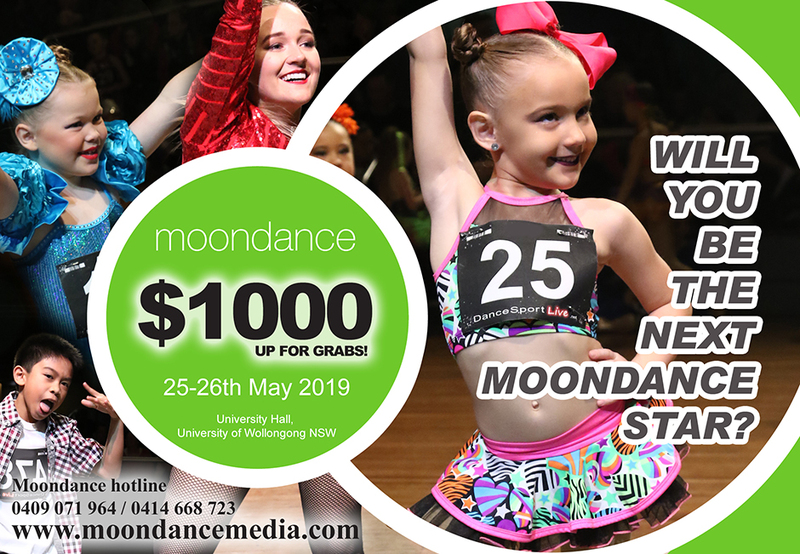 Moondance 2018 offers troupe events & elimination round solo, duo or trio events with all finalists receiving a prize! Solos, Duos/Trios are placed into heats, where upon adjudicator’s re-call selected competitors proceed to the next round. In our 16th year, we continue to offer over $1000 in cash prizes. 3 experienced judges make our comp fair & fun! Our new and exciting event is the “Senior Solo Challenge”. Competitors battle it out “dance for your life” style on the Moondance Stage. Moondance takes place at the University of Wollongong, a 5-min drive from Central Wollongong or 1-hour from Sydney. The University Hall is surrounded by magnificent gardens and offers ample seating, parking and plenty of room to move. At Moondance no entry fee is charged for events, all competitors simply purchase an admission ticket. Admission is free for the Principal of the studio. Principals do not pay for troupe entries! Moondance 2018 will bring out the best in your students. Solo Sections: Novice, Restricted & Open. We value the opportunity to provide a safe, professional performance and learning experience for our competitors. We cater and nurture all levels from the novice through to those with a serious ambition and dedication to progress to a professional standard. Over $10,000 in cash prizes. On offer are Classical Scholarships: Senior $2250; Intermediate $1100, Championships for Classical & Jazz. For further information on all events please contact Australian Teachers of Dancing. Solos: 20 – 27 Sept & 30 Sept – 5 Oct. Venue TBC. Please check our website for more details. Styles: Classical, Contemporary, Jazz, Tap, Modern, Musical Theatre, Lyrical, Hip Hop, Song & Dance, Duos, Trios, Championships. Dancers, get ready to be part of the most significant performing arts competition of 2019! Put all that training into practice and gain essential experience performing on stage to a respected adjudicator and live audience. 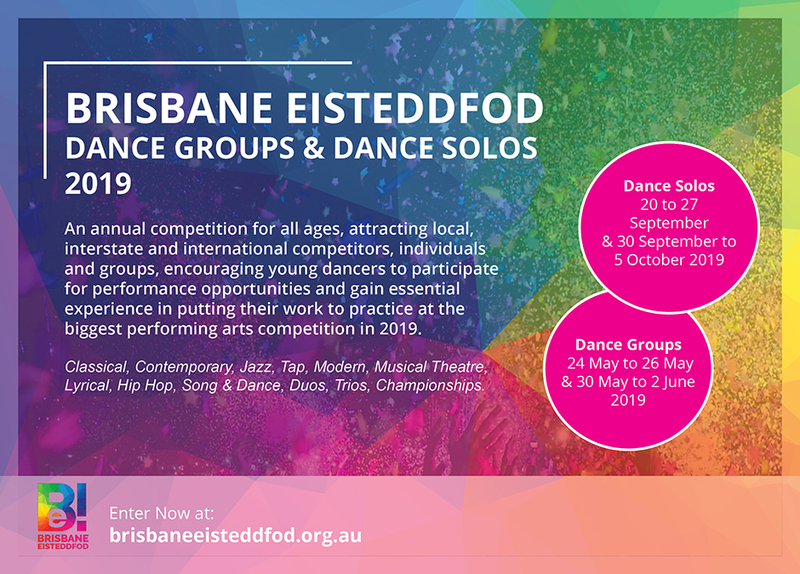 The Brisbane Eisteddfod is an annual competition for all ages, attracting local, interstate and international competitors, individuals and groups. Styles: Classical Ballet, Jazz, Tap, Musical Theatre, Song & Dance, Song & Tap, Lyrical, Contemporary, Hip Hop, Novelty, Acrobatics, Group Improvisation, Cabaret, National, Cultural/Ethnic, Glee, Choreography, Mature & Motivated. Scholarships for Soloists (no prerequisites) in Ballet, Contemporary, Jazz, Tap, Musical Theatre, Choreography & Drama. 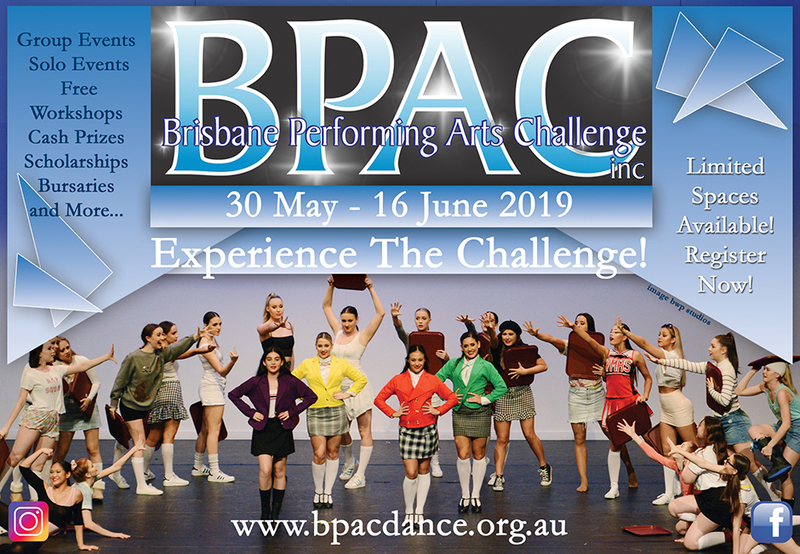 BPAC is achieving recognition as one of the leading Performing Arts Events in Australia. Committed to fostering a professional and friendly environment that maximises opportunities for all participants to realise their full potential. BPAC endeavours to engage a panel of highly professional guest teachers and judges. Sponsors include: The Australian Ballet School, Harlequin Floors, WAAPA, Dein Perry’s ‘Tap Dogs’, Ev & Bow, Ministry of Dance, Brent Street, Village Nation, Capezio, Bloch, Energetiks & MDM to name a few. and encourage competitors with opportunities to participate in professional, up to date workshops and receive prizes that will enable ongoing education in the arts by way of scholarships, valuable equipment and bursaries. BPAC is so very proud to have Ms Kelly Abbey as our Patron and thank her for her continued support and enthusiasm. Solos: Albert Waterways Community Centre. This is year 38 of the Gold Coast Eisteddfod, the largest of its kind in Australia. The competition is staged each year in August & September for Dance, Bands, Orchestras, Instrumental Groups, String/Brass/Wind Instruments, Pianoforte, Choral, Vocal, Speech & Drama, Speech Choirs & Young People with Disabilities. Full Syllabus and entry is available on the website – entries close May 10. Dance is a very large part of the Eisteddfod running for 3 weeks in two different venues, the competition includes Primary & Secondary School days along with Studio groups on weekends and Solos on weekdays. We have 4 fantastic adjudicators lined up to judge your talent. We so look forward to welcoming you to the beautiful Gold Coast for this year’s Eisteddfod. The Ipswich Junior Eisteddfod Society Inc.
Groups/Troupes: Tap, Street Tap, Song & Tap, Song & Dance, Musical Theatre, Cabaret, Lyrical, Jazz Up-Tempo, Contemporary, National, Novelty, Classical, Acrobatic, Hip-Hop. Restricted Groups in some genres and Primary/High School items. Solos (Duos and Trios): Tiny Tots, Tap (Solo, Waltz, Speed, Championship, Novice), Song & Tap, Song & Dance (Championship), Lyrical, Jazz Up-Tempo, Contemporary (Championship, Novice) Classical Character/Demi-Character (Championship, Novice) National, Acrobatic/Novelty, Improvisation, Own Choreography, Musical Theatre, Cabaret/Broadway Jazz, High Score Champion Items. Schedules are now available. Event will run for 3 weeks and some solos may need to be incorporated in group dates depending on entries. Looking forward to seeing you all again this year. We pride ourselves in running a very friendly and relaxed event. All music is played for you and Dancevision.TV are there to capture all performances and take some great photos of all competitors. Our dedicated volunteers provide an encouraging and supportive environment for all levels of competitors and we love to see the continued development in all the performers each year. For further information, please contact the Convenors via email or visit our dance facebook page. 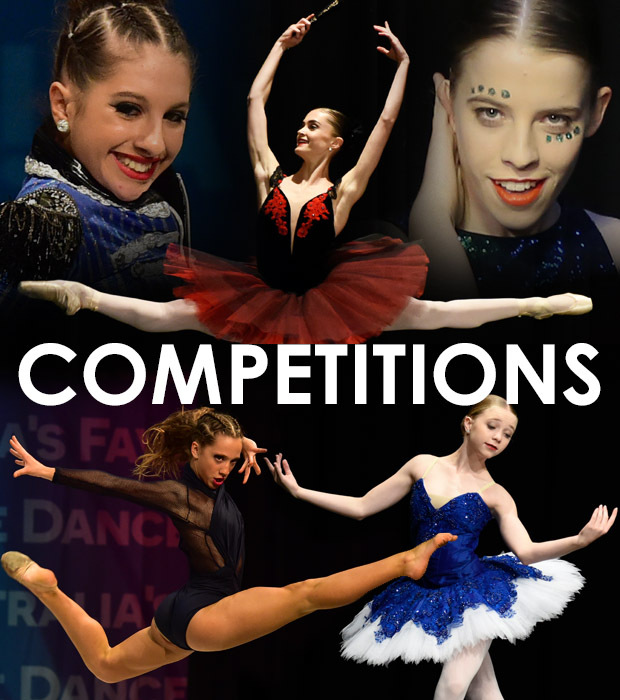 Entries close 1st April 2019 entries are open now on comps online..
Young Dancer Awards. Each entrant is to perform a classical ballet solo of their choice. No repertoire. Venue/Location: Celebrate our return to Ballarat’s Her Majesty’s Theatre! 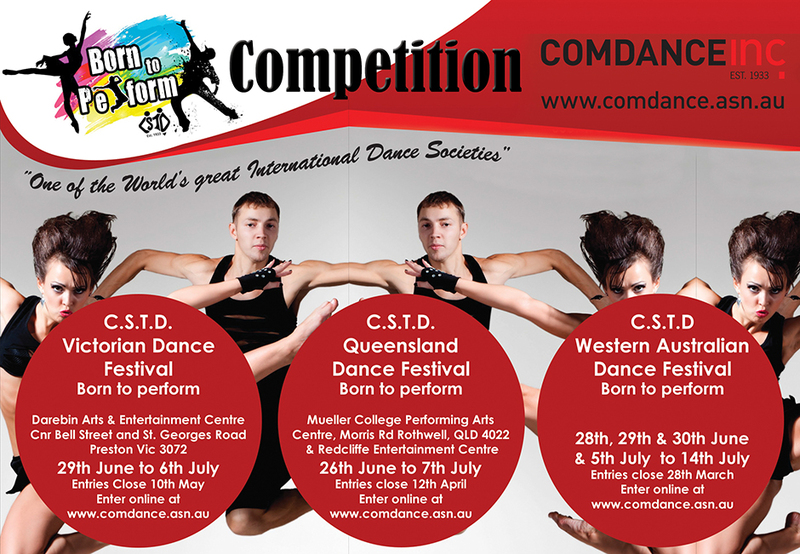 Sections: The Challenge is open to Dance Schools and Community Groups. The majority of participants must fall in the 12-24 age range. About: Have you got a story to tell? Want to tell it through dance? The Wakakirri Dance School Challenge returns in 2019 after a thrilling debut in 2018. The Wakakirri DSC is the ultimate experience for dance schools and community groups who love Wakakirri’s ‘Story-Dance’ format. The challenge? Create 3-7 minute Story-Dance with a group. Tell any story and use any combination of dance, creative movement, acting, music, live singing, props, costumes, sets and film projections. The possibilities are endless! Come together to perform live on stage in a professional theatre and walk the red carpet with Wakakirri’s Panel of entertainment industry professionals. You could be in the running for the $1000 First Place prize! Please note: the Wakakirri DSC is a Victoria-only event. Plans are underway to expand to other States in the near future. Participants should be aged 12-24 years.